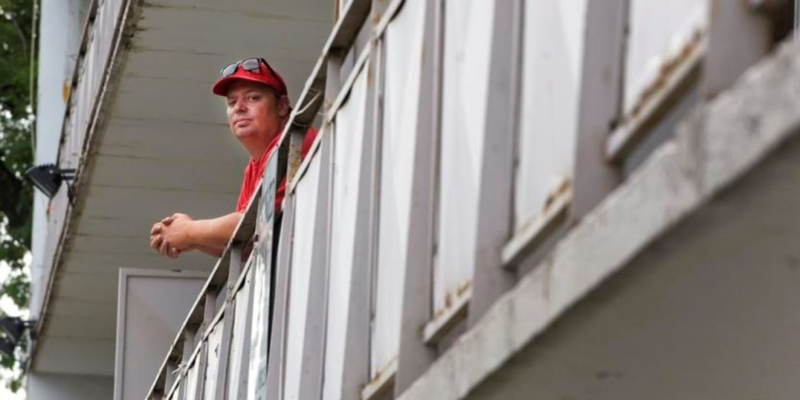 He’s fought his battles, now he’s helping others … and leading a slumlord tour of Hamilton. 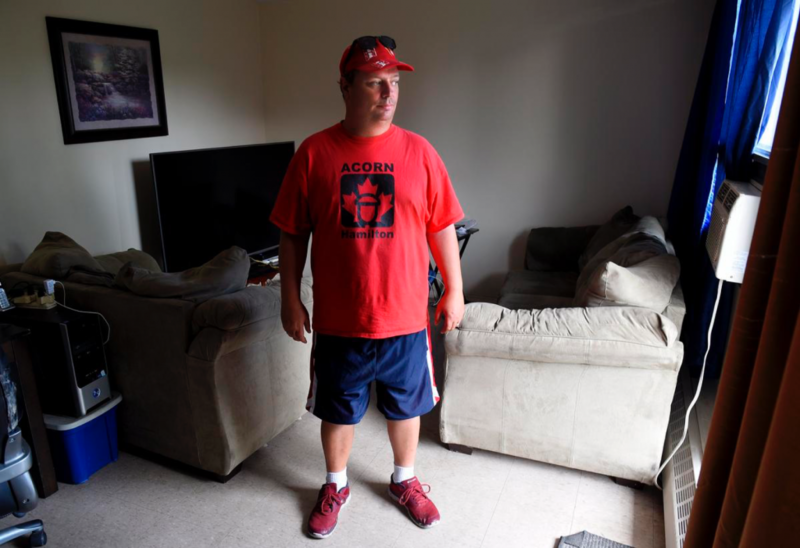 As chair of Hamilton ACORN, Mike Wood spends hours taking calls from troubled tenants, organizing rallies and fighting for change. A tour of Hamilton’s slumlords: Unfortunately, it’s an excursion Mike Wood is distinctively qualified to lead. The 41-year-old has lived in a string of dives kept by bad landlords since he struck out on his own as a young man in the northeast city. That’s why he started advocating for tenant rights in Hamilton a couple of years ago. Wood can be seen downtown looking for people to sign a petition asking the city to pursue Rent Safe, a system adopted in Toronto whereby landlords enter a registry and pay fees that go toward bylaw enforcement. Or leading a march of placard-carrying renters in red T-shirts down Melvin Avenue demanding landlords repair rundown buildings. The slumlord tour is scheduled for Aug. 30. ACORN is renting a bus. The activism is a sign of the times. Renters are fighting back and getting organized in their struggle for decent homes in aging and deteriorating apartment buildings. The advocacy also comes in an era of rapidly rising rates and plummeting vacancies as land values escalate with scant purpose-built rental stock built for many years. 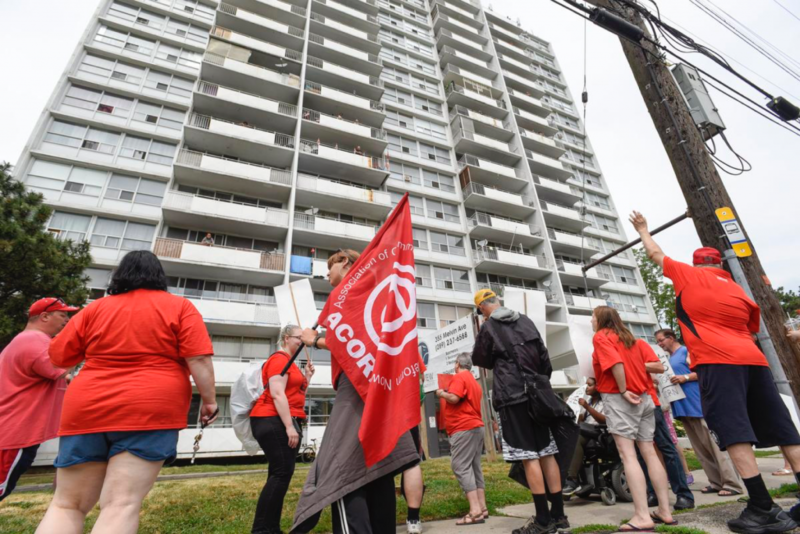 Along with ACORN, the Hamilton Tenants’ Solidarity Network has waged its own battle against hikes, tenant displacement and poor living conditions. For Wood, it seems an all-consuming task. 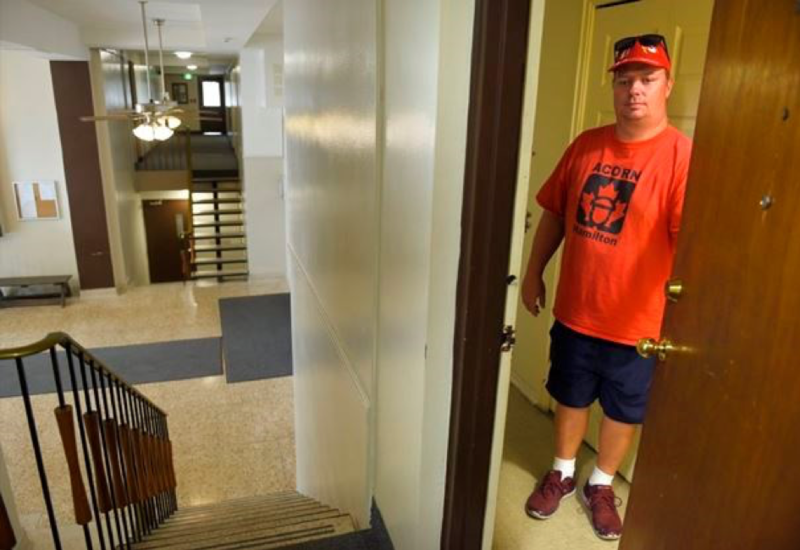 He puts in long days — sometimes leaving early in the morning to meet with tenants wanting to organize and not coming home until 11 p.m.
Home is a modest one-bedroom apartment he shares with his wife of 23 years, Tabitha, in a King William Street highrise. They pay $870 a month. But the vast majority of his energy is focused on the grievances of others. Wood says he helps tenants learn about their rights. But Wood says tenants shouldn’t have to fight for the basics like adequate heating, pest-free units, and walls that aren’t crumbling and mouldy. He’s critical of how the city’s property standards division responds to complaints; in some cases, landlords have failed to act on orders for repairs months after deadlines. For him, one egregious example is 285 Melvin Ave., an aging highrise near Parkdale and Barton streets, that had been subject to a 20-item property standards order since late April with a completion deadline of May 28. In late June, the city said the landlord had started working on the issues. “Our officer will follow up to evaluate the work and anything not completed will be addressed by our contractors and costs added to the tax roll. Charges will then be laid for noncompliance,” Kim Coombs, manager of licensing and bylaw services, told The Spectator. As of Thursday, city bylaw services said 16 files remained open at 285 Melvin. Wood’s patience has worn thin. Others are fed up, as well, he says. The organization helps wage the individual battles but also the broader fight to effect change through government legislation. Wood recalls how ACORN members mounted a rally outside the Lincoln Alexander Centre where Progressive Conservative Leader Doug Ford was making a campaign stop during the election. The former Toronto city councillor peered out of the window, but didn’t exit the building near Gore Park. “I don’t have much faith in Doug Ford … He’s not for the people like he claimed he was,” Wood said. In Ontario, landlords can hike rent as high as they see fit once a tenant leaves a unit. However, they can only increase the rent of existing tenants to the annual provincial guideline, which is 1.8 per cent this year. Above-guideline increases, reserved for a limited set of major expenses, are exceptions. Last Friday, Hamilton ACORN issued a news release targeting Ford on another front: Cuts to planned social assistance increases and the end of Ontario’s basic-income pilot program. A rally is planned for Thursday at 1 p.m. outside the provincial government offices at 119 King St. W. downtown. Sarah Jama, a member of ACORN for about a year and a half, holds Wood in high regard. Jama, who worked in Coun. Matthew Green’s office and is now outreach co-ordinator at the Hamilton Centre for Civic Inclusion, agrees tenant advocacy is intensifying. 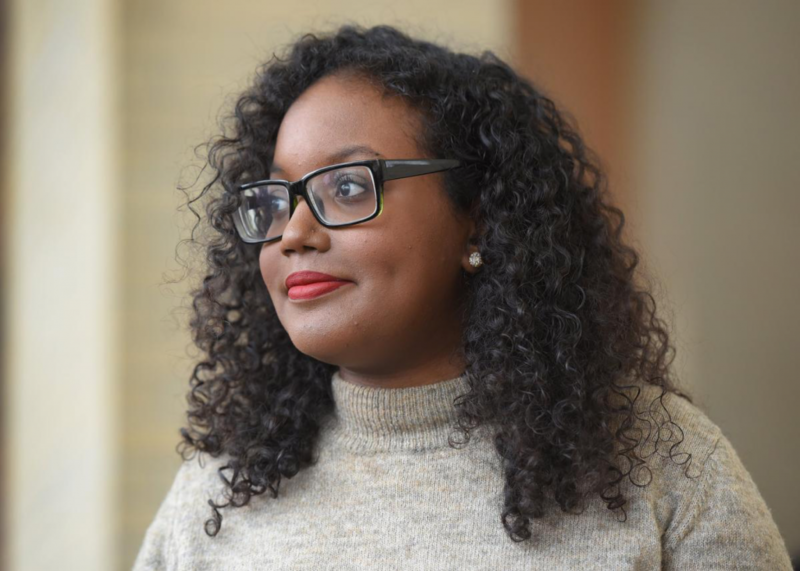 “People are no longer organizing in silos; people are starting to work together,” said the recent McMaster social sciences graduate. Jama said she was drawn to ACORN in part because it’s led by people living in the situations they’re trying to improve. Wood, for instance, grew up in City Housing. His father was employed by the city doing a number of jobs including paving, sewer work and other maintenance. One winter’s day, he had a heart attack while on the job on a Mountain access during a blizzard. Things deteriorated after a subsequent stroke, leaving Wood, then 11, to take care of him while his mom became the sole breadwinner. “I basically became the man of the house at a young age,” he says in a soft voice. He moved into his own place with Tabitha after high school. Their first apartment was the top floor of a triplex in the Barton Street East area. Wood recalled how he came home one day to find the landlord sitting on his couch. More grief, including a fire, bedbugs and dishonest building owners, followed, he says. These experiences are echoed in those he’s trying to help. Many will simply stick out the duration of their lease despite problems because they don’t know their rights or can’t afford to make a stink, Wood says. One of his latest files involves three people living in apartments carved out of an old brick home on Wentworth Street. The residents are reluctantly involved in a long-running and tense dispute with their landlord. ACORN held a rally there to support them. That evening, when everyone had long left, Wood was back to support the tenants after the landlord uttered he’d called the police. He’d already spent two hours on the phone with one tenant in case he needed to serve as a witness to any untoward behaviour. This entry was posted in ACORN, ACORN International, canada, Organizing and tagged ACORN Canada, housing, landlords, Mike Wood by Wade. Bookmark the permalink.